From Von der Universal Tinctur, by Christian Wilhelm von Krohnemann, 1677 — Source. What do we call magic? And, to quote Hotspur, does it come when we do call it? The easiest modern definition of magic would be simply ‘a supernatural force or power’ which implies quite directly ‘a force or power that does not, in the usual sense, exist.’ When something is described as ‘magical thinking’ the intent is to say that the thinking cannot explain the thought; when we say something is done ‘as if by magic’ we do not intend that magic is, itself, a practical possibility. We often, effectively, speak of magic as something which does not, perhaps cannot, exist. The practice of magic is, in this sense, impossible: there’s nothing there to grasp. It will, always, elude us. This creates an interesting problem, if one is interested in both magic and the fantastic. Fantastic fiction often includes magic, which in most cases definitely exists as something within the fictional world. Indeed, magic is often perfectly natural within these worlds – Earthsea, Narnia, Morrowind, the Discworld, all magical to a fault – which further puzzles us: it cannot be supernatural, in that case. Magic in this context cannot be magical, being instead something else entirely. Some authors solve this problem with new terminology, but the ruse rarely holds. Some of us are passionate about magical systems, some about the numinous wonder of magic, but nonetheless, we affirm its reality within these unreal worlds. And that is the key: magic in fantastic fiction is precisely that which can exist in those worlds, and cannot exist in our own. It is a subordinating factor, in this sense: any world which contains ‘magic’ is cast on the mold of our own, notable for the ways it does not follow our blueprint. There is a strain of thought in fantasy which requires the author to affirm the power and primal reality of the technical knowledge of our own sphere; the scientist, the method of experimentation, becomes the key to unlocking magic. Magic becomes a new prey for this science, which is itself clearly an intrusion of our own reality into this other – or else ‘magic’ would never be set apart from the inquiry in the first place. (The inverse of this, in which magic is ultimately not subject to human thought, and affirms the incapacity of reason, is only a mirror image, in which the same opposition to the real wins out). But: perhaps this is inevitable, that we should understand the magical world as the counterfeit of our own. Perhaps what we feel is lost, the substance of reality, could not in any case inhere to fiction. Yet magic has existed in many of the worlds humans have believed themselves to inhabit. Historically, practices we now call magic abounded. The Greek góēs, the alchemist, the haruspex and court astrologer and necromancer and magus, all were recognized as having powers beyond the common strengths of weaponry or law. Moreover, little spells were known to people, for love and cursing, for health and security. Even today, each of us may have our own practices others would consider supernatural and in vain. As such, we find that the world we used as a model for others is split into many of our own – we could define magic as something that exists in your beliefs, and not in mine. But then, none of us could possibly do magic, as what I believe in is not magic, and who would perform rites in which they do not believe? So, under the framework that magic simply doesn’t exist, it’s a pejorative, an attack. The word itself comes from the Magi, a particular kind of Zoroastrian priests, as imagined by the Hellenic Greeks: but ironically, they believed more strongly in the magic of Magi than their own. Anticipating centuries of European occultism, some Hellenic author put Grecian magical practice in the mouth of Zoroaster. Alchemy derives its name from Kemet, the ancient world’s name for Egypt. Magic practiced in one place has often been attributed to an origin in others, as have perfectly mundane forms of knowledge. People purport to believe in magic, local and foreign; they even purport to practice it. Any practicing hermeticist would take umbrage at this entire essay, and its intent to create a universal concept that includes both their practice, and practices they consider unreal. To every magus, their magic existed, though it may have arrived after a winding journey from a foreign land. The distance afforded by irony can be useful, in straightening out our symbolic orders, but to the alchemist, the original is not ironic, but aureate. So we arrive at an impasse: We cannot define magic by whether or not it exists. Magic’s crude reality cannot be implied by the word, because if it is, then it simply vanishes or affirms all things. Instead, let us return to those historical examples, the true models on which the fantastic is broadly based. Historical sorcerers are not all irrational, though some are ecstatics: the hermetics and theurgists were firmly in the camp of reason. They are not, as a rule, effective, though nobody would dispute the effectiveness of herbalism: hardly anyone would defend a Roman augur’s claims to future knowledge now. They shared no underlying system, though scholars have driven themselves to distraction defining some transcendent tradition – when shivashakti and hermeticism and Daoist alchemy all disagree on the qualities of their “universal gender binary,” we must admit that even apparent points of agreement barely agree. But they do all share the simple qualities of practice. All are ritual behavior, performed in the hopes of evoking some effect, according to hidden – that is to say, occult – laws. The effect may be solely internal, or cosmically powerful, and we may not expect it to manifest in practice, but magical traditions share a belief in a hidden stratum of reality, through which the sorcerer acts. The Neoplatonist Iamblichus wrote extensively on theurgy, the magic of ritual invocation of the gods. He was criticized in this by his teacher Porphyry not on the grounds that these rites did not accord with something real, but that the method was faulty: Porphyry possessed a belief in the occult laws, but not in theurgy as the means to activate them, which is a very different kind of disbelief than one is accustomed to. And once again, the mystique of Egypt was invoked: Iamblichus titled his grimoire “On the Mysteries of Egypt.” This word, “mysteries,” is important. Regardless, here we have a definition of magic in our world, neutral to the workings of the universe. In fact, it even carries with it the other senses of magic. When we applaud the magical effects of music or literature, we applaud its power to move us without our expectations, a motive force occult to our understanding that plays upon the hidden strings of the heart. When we see a skill that we deem ‘magic’ it is a mastery unknown to us. So this is magic: The invocation of occult processes, by ritual means. 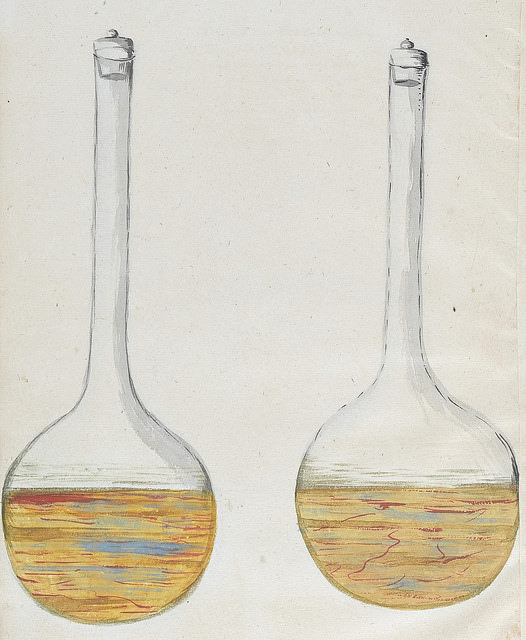 Alchemy, in particular, makes for a classic schema: The alchemists were interested in the production of gold, and chemical reactions, but their framework bound what we might now call chemistry to a deeper set of causes and results. Cleopatra the Alchemist, an early (and verifiably) Egyptian writer on the subject, instructed the would-be alchemist in the search for ‘the All’ rather than for gold: the Magnum Opus, or great work, was understood as a vessel for symbolic understanding of the universe, as well as gold and immortality. The hidden qualities of chemicals were themselves a cipher for the hidden qualities of enlightenment, both of which could be pursued through each other. Alchemy proved compelling: in Europe, its practitioners would stretch from the 3rd century BCE at the latest, to the moment of the foundation of modern chemistry. Sir Isaac Newton himself would create his own translation of the Emerald Tablet of Hermes Trismegistus, the apocryphal foundational document of hermeticism and alchemy. Matter’s properties almost ache to be understood magically, as transformations and reactions occur with regard only for properties hidden from easy understanding. Or take, for example, verse – bound by ritual forms, language sways our emotions. Programming, as well, has a claim to an efficacious magic (at least, its laws are occult to me). Tabletop role-playing games, elaborate fantastic worlds, shared phantoms of the species like law and ideology – there are ritual methods of evoking things with no physical reality, which nonetheless have power. In fact, one might argue many such magical rituals can overpower physical reality, at times, and transform it, when an idea inspires its implementation. As for the stubbornly material: the chemical sciences descend in no small part from the example and experiments of alchemy, and while the symbols of the Magnum Opus proved to have no claim on physical matter, the occult force of the molecule and atom were ultimately found. Is this not magic, in a sense? I think it has a family relationship, a line of descent, but not a shared identity. Material sciences have lost their magic, in the sense of being too known and open to the world, too lacking in ritual. Indeed, that which undoubtably exists often finds itself denuded of ritual trappings – when the occult becomes overt, it passes from magic into simple fact. But some magic remains: those rituals that deal in that which does not overtly exist. The practice of magic, then, ends up where we began: effort with an object whose existence is at best in doubt, and more often certainly absent. But humans are unique in the universe, as far as can be discerned: Things which do not exist can shape us, and we mint new unrealities constantly. This essay is an exercise in ideas, and only operates on the level of things that don’t exist (and broadly at that). Like the Magnum Opus of the alchemists, the production of a concrete product is only the outward form of an internal project. Where they sought to perfect the soul through chemistry, I hope my more modest project might help the reader see historical occultism in a charitable light. What is the practice we call magic? The exercise of the human mind towards hidden things, through tools and ritual. The practice of shaping things which do not exist. And does it come? Of course.